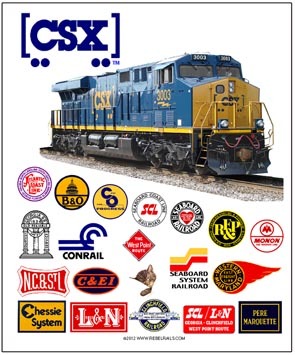 CSX Railroad today consists of many of Americas greatest railroads: L&N, ACL, SAL, C&O, B&O, NC&StL, MONON, WM, C&EI, Individual marks are licensed marks owned by CSX Railroad Company and are used under an active license agreement. 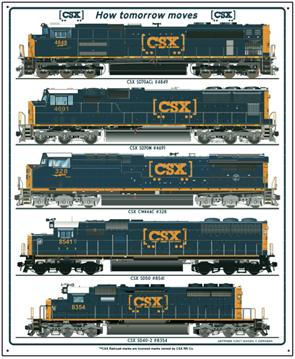 CSX Coffee Mug featuring the railroads newest diesel in the latest color scheme with 18 logos of its heritage railroads on the reverse along with Chessie. What a great, colorful and informative coffee mug. 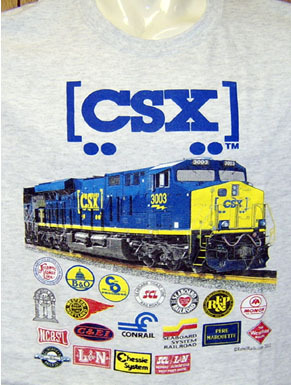 CSX Heritage T-shirt featuring colorful logos of predecessor railroads that make up the CSX Transportation system. Diesel photo courtesy Tommy Ealey. Screen Printed by Rebel Rails. 6 inch x 6 inch square tin logo sign of the CSX Railroad. 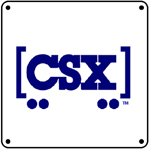 6 inch x 6 inch square tin logo sign of the CSX Railroads new logo. 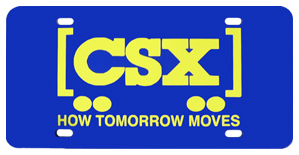 A blue plastic license plate with the classic CSX logo and "How Tomorrow Moves" tag line. What better way to show your interest in one of America's premier railroads. 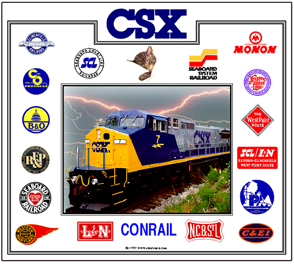 CSX Mouse Pad featuring diesel image surrounded by logos of predecessor heritage railroads. Tin sign featuring a collage of the CSX Railroads various diesels in the latest color scheme.